Steve ‘Stavros’ Parrish is a proper joker. He tells awful jokes, plays daft pranks, and bullshits with the best of them. He talks for England on the MotoGP commentating gig, and is, generally, a right old laugh. But, he is, also, a world-class racer. Okay, it’s a few years ago now, but he was right up the sharp end in Grands Prix in the late 1970s and 80s, finishing fifth in the 500 championship in 77. So he knows plenty about how to ride bikes fast. Said bend is not far from the Portimao race track in Portugal, where we’re based for today’s shenanigans: the world launch of Avon’s new Spirit ST sport-touring tyre. The Melksham-based outfit also unveiled Meester Parrish here – he’s signed up as a ‘brand ambassador’ for Avon, and is helping them out with tyre development and the like. Much of his racing career took place on Avon tyres, and he’s clearly got a spot in his heart for the British brand. Next up, we’re out on the road. It’s not a massive circuit – about 30km up the hill and back down again, but there’s a lot on the route: blind, decreasing radius corners, uphill hairpins, longer straights, and a bit of dual carriageway near the track. I jump on the Yamaha Tracer 700 for a gentle introduction, and we’re off, following Parrish-san. Now, the Spirit ST is designed to shine in more typical UK conditions: the tread pattern and compounds have been optimised for far wetter, colder roads than we have here. But it’s the nature of a modern tyre that we expect great all-round performance, and the Spirits are working really well. The little Yamaha doesn’t have hundreds of horsepowers of course, so the rear doesn’t get much grief, but I’m reassured by the feel from it when you get on the gas. The front is put under a bit of pressure though – as always, when you’re riding a strange road, you do end up having to brake a bit sharper than you maybe planned, if a bend suddenly tightens up, say. And here, in particular, I’m liking the Spirit a lot – there’s ample grip available, and I feel like I know what’s going on down at the end of the forks too. As always with brand-new tyres, the unworn profiles make the bike feel a little more nimble and agile, and the Tracer feels accurate and controlled turning into a bend. It’s super-stable too though, even over some appalling bumps and dips in the Tarmac. We’ve done a lap of the road circuit, and as I swap from the Tracer onto the Kawasaki Z1000 SX, there’s a very different feel to proceedings. The Z1000 is a proper lump in comparison with the Tracer, and a little more ungainly through the tighter bends. There’s a load more power too of course, but the rear Spirit takes it in its stride, with no problems at all. But then, I get a little bit clever on the fast autoroute section following Steve Parrish, and end up with the aforementioned near-miss… The Spirits were unfazed by my hamfisted antics though, and just got on with the job in hand. We spend the rest of the afternoon on the road, up and down the hill, on various bikes, and the Spirits still feel good. From the monstrous KTM Super Duke R 1290 and Suzuki GSX-S1000, down to the little Tracer 700 and Street Triple 675, I’m more than happy with the rear grip under power, and the front on braking. There’s a comfy, reassuring feel to the Avons. Part of that is down to the conditions of course: a warm, dry road ride isn’t a massive challenge for a new tyre these days. Next morning though, and we’ve got a tougher test in store for them – half a day blasting round the Portimao circuit. Now, we’re still using the same bikes, including some unlikely track options. 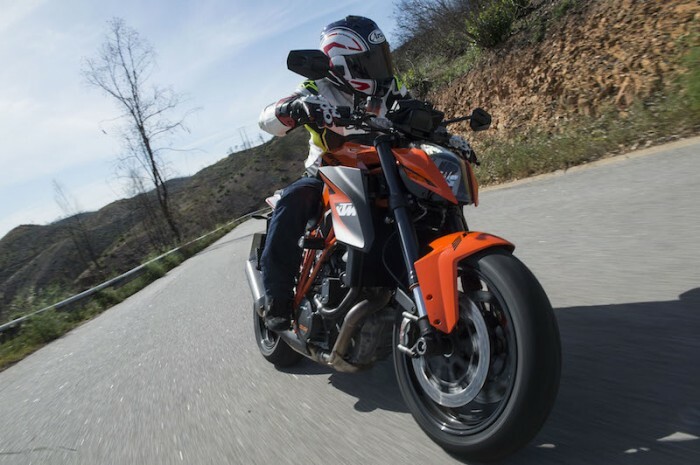 Those range from a Yamaha XSR900 retro-roadster through a KTM Adventure up to a Yamaha FJR1300. 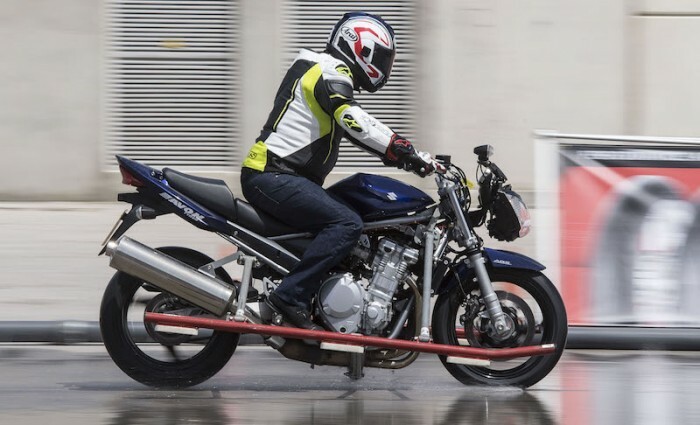 But there are also a few bikes which should be right at home here – that mad Super Duke, Triumph Speed and Street Triples, Honda CB650F and VFR800. How at home on track should the tyres be though? Well, the Avon guys are keen to point out that this is, very much, a road tyre, aimed at doing up to 10,000 miles on motorways and wet commuting roads. So we’re some way out of its design envelope here – but we were about to see how this new sport-touring rubber would cope. I was at Portimao back in January for the Fireblade launch, so it was still fairly fresh in my mind. The first session was very much a bedding-in one though, especially since I ended up on the KTM 1190 Adventure giant traillie. The Spirits are made in adventure-bike sizes of course, to cater for all the tourers who now use this type of bike. I do a few laps, remind myself where all the big bends are, and come back in. The KTM is a fabulous bike, but it’s not been built for a WSB racetrack, and with the big 19” front wheel, long-travel suspension and low pegs, I’m not feeling a lot of love for it. It’s pretty much an open pit-lane this morning though, and when one of the other journos comes in and drops off a GSX-S1000F, I leap on that, and set off again. It takes me a lap or two to get back into the GSX-S1000 groove – I had one on long term test last year, and had forgotten how jerky the fuelling is as stock, so I end up fifty-pencing some of the longer bends. A smoother hand though, and things get better, and I gradually up the pace. The Spirits are doing really well still – this is a heavy, powerful litre sports bike and while it’s a level below the proper superbikes, it’s still got plenty of grunt. I’m still liking the front tyre, especially on the brakes, and there’s easily enough grip to start decking out the pegs, hard. I’m starting to feel a tiny bit of movement from the rear though – just at the start of the power input out of a bend, there’s an odd skip or two. Next session is on the Super Duke – which feels like a hard-edged Tomahawk missile compared with the big, soft GSX-S1000. It’s almost too much though, and I’m on-edge a bit straight off. I’ve put the traction and ABS into full track mode, and before long, the massive gobbets of torque are overloading the rear Spirit completely, giving big slides out of the slower bends. The 160-odd bhp motor and its huge low-down torque would challenge a proper trackday tyre, so it’s perhaps not a surprise that it can overwhelm the Spirit round Portimao. But, suitably warned, I take a little more care getting onto the power, and the rest of the session goes well. I spend the rest of the riding day trying out as many bikes as I can wrest from all the foreign chaps, and I get the same impressions from them all. The bigger bikes (Speed Triple, GSX-S1000, Super Duke) are able to get to the limit of the rear tyre grip fairly easily on track, and you need to be careful on the way out of a bend. With the smaller bikes though, there’s no problem at all – the XSR900, Suzuki GSX-S750 and Street Triple feel fab, with the rear tyre digging in all the way through a bend. The front tyre is fine on all the bikes though – braking is solid and assured – although some of the racier riders on the launch aren’t as happy with the front, complaining of a lack of feel when they really pushed on. I’m in love with the 675 Street Triple today though. It’s a fabulous blend of power and poise, and the moderate power is a great match for the Spirits. I can get as hard on the brakes as I like, and slam on the power sooner than anything else, with no drama at all. It’s super-accurate too, and I’m able to pick better lines all round the track. Amazing fun. The day’s over now, and I’m definitely impressed with the Spirits. We’ve only tested half the story of course – and it’s actually the weakest part for the Avons. They’re designed to excel in normal road conditions, including wet weather riding, rather than brain-out track action in the sun. The fact they did so well at Portimao is remarkable though – and we’ll be looking to try them out in crap UK road conditions as soon as we can. *Expect to pay from £200-£265 for a pair of the new Spirit STs, depending on size.